This is my second attempt at making the information contained in the traditional league table a bit more useful, inspired by the late Jenny Cann’s tables. 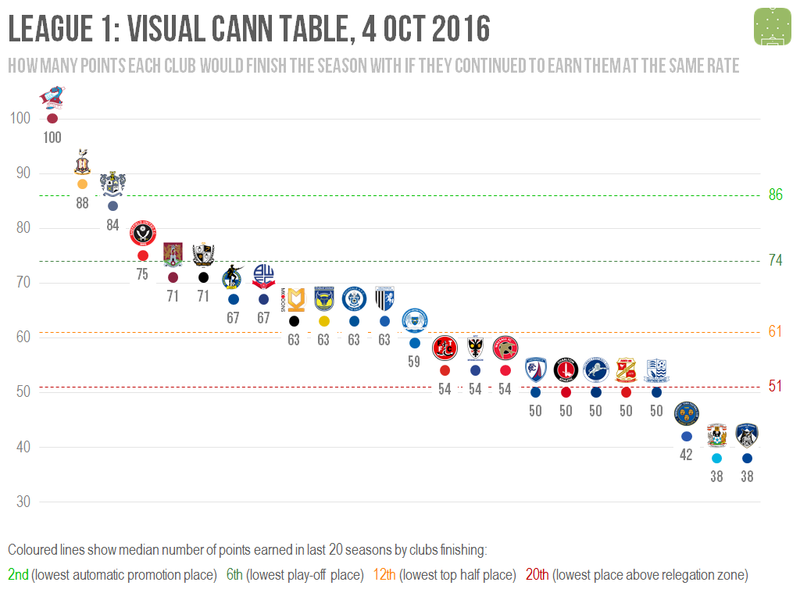 The main feature of the original Cann table is to space the clubs out in proportion to how many points they’ve won, making it easier to see where (and how big) the gaps between teams are. It corrects for clubs having played different numbers of matches to each other, which can otherwise give a misleading impression due to the number of weather or cup-related rearrangements. It makes it easier to see where clubs are on course to finish and how many points ahead / short of their target they’d be if things stayed the same. This feels more useful than presenting the current points totals and expecting the reader to mentally extrapolate them. The clubs are arranged on a vertical scale, just like in a standard Cann table, only strung out in a line and using their badges to identify them. Their position is identified by the dot, with the badge above and their projected points total (rounded to the nearest whole number) below. If two clubs are equal on projected points, ties are broken by goal difference per match, then goals scored per match and finally by alphabetical order (much like the real table). In addition to having a horizontal line every 10 points I’ve also used dashed lines to superimpose the average points totals for clubs finishing in key positions to give some additional context for each club’s progress. This has been done by taking the median points tally for those positions across each of the last 20 seasons, i.e. that half of the last 20 occupants of each position will have finished above the line, and half below. Following some confusion on Twitter, I wanted to make clear is that this isn’t intended as any kind of prediction (although if you’ve come here looking for predictions, I have plenty of those too). This is all about taking the information from a standard league table and rendering it as something more useful. Finally I need to thank Ben Huxley for helping me with the design. As with many of my attempts at creating graphics, this looked far more amateurish before I’d gotten his feedback.